Well, that year was something else. Like a lot of people I know, the body blows of the news the world at large were tempered by a year that was personally rather good. I managed to actually beat my year list total, as accounted by eBird, by one bird. I went to Ethiopia. I bought a house. I saw Painted Wolves again, my favourite species ever. I also managed to go to 10 different countries, so rather than arbitrarily pick my top 10 birds of the year, I’ll arbitrarily pick a top bird from each country. I’ll also award each bird an award based on why I picked it. So, with no further ado, and in no particular order…. Common Loons, or Great Northern Divers, are one of those iconic birds that I remember vividly from days before being a birder. In particular they evoke the New Hampshire lake my extended family descends upon each summer and has done so from before I was born. The winter plumaged one I saw on a freezing marine lake on the First of the Year was certainly an interesting recontextualisation of that memory, but as it was the same bird that was the first of these I have ever seen in Britain and still evoked warm feelings of childhood summers, it gets the nod here. 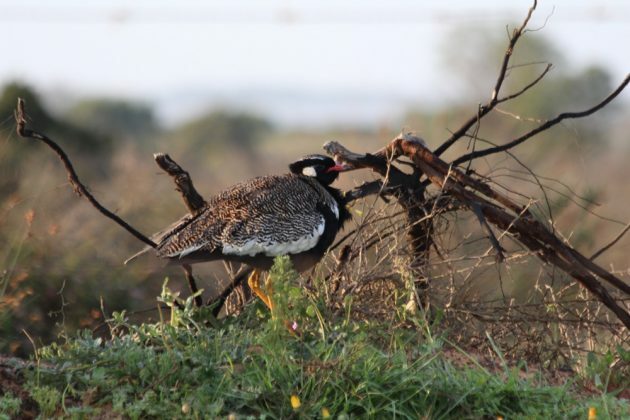 I failed to see a Southern Black Bustard on my last visit to West Coast National Park near Cape Town. So what did I do? I hired a guide to find one for me and I saw it. No drama birding at it’s best. (Honourable mention to the Cape Rockjumper). I saw a number of lifers this year in New Zealand, but my bird of the year is one I heard but didn’t see. The Orange-fronted Parakeet is a critically endangered species that I came agonisingly close to seeing but didn’t. But I still heard it, and was privileged to spend time in it’s home. You don’t need to see birds to appreciate them, to enjoy them, to marvel at their survival in a world set against them, and that’s why it’s my NZ bird of the year. Hopefully I’ll see it this year. I’m certainly going to try. I saw a number of cool birds on two seperate and short trips to Melbourne this year. The standout was the Cape Barren Goose, which not only has an awesome name but is also thought to be the last survivor of a lineage of geese that used to forage the grasslands of Antarctica before the whole place got all icy. That’s an origin as cool as Superman being the last son of Krypton, and wins the goose the Aussie birds of the year award. 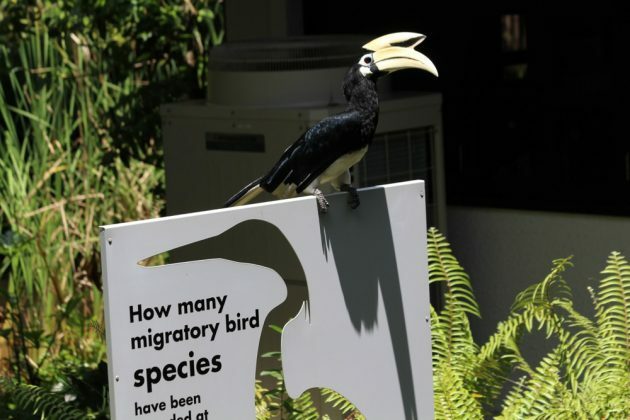 Singapore is a densely populated city-state which still manages to protect a number of species. One of the coolest of these urban species, no matter how many times I see them, is the Oriental Pied Hornbill. Who can fail to be impressed by any hornbill, especially one that was the advance party of a number of species which are recolonising the country. Ethiopia: The You Saw What Award? Ethiopia is home to many endemic specialities to make even the most jaded bird salivate. So clearly I have to award the Ethiopian Bird of the Year award to the Red-billed Chough. A bird that isn’t endemic, and isn’t even common there. But it’s a species I’ve tried for years to see in Britain and failed to, so of course I saw one finally at the extreme edge of it’s range in Ethiopia. The only reason that the Golden Eagle didn’t get the same award for the same reason is that I hadn’t tried as hard to see one in Britain in the past. I never left the airport on my 13 hour layover and never saw a bird. So I award this spot to the endemic White-cheeked Turacos I saw in Ethiopia and can’t help feel were robbed by the choughs. 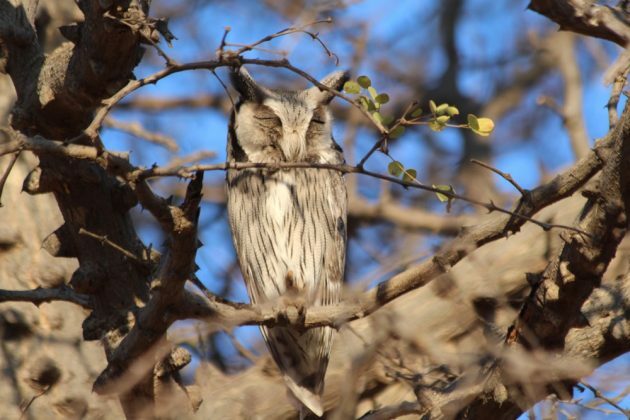 Southern White-faced Owl or African Scops Owl? I still have no idea. Okay, context. I was on a layover and didn’t expect to see much. I was mostly interested in cathedrals and shops and chocolate. But I did some birdwatching and saw a treecreeper and assumed it was a Eurasian Treecreeper because I’m from Britain and what else would it be? But I get an email from some eBird list manager (I always cringe when I get those emails) telling me I need some proof. I had none. It was almost dark and I had seen it briefly. No notes. No photographs. It was a treecreeper, amirite? But, in Zurich, apparently, that means it was a Short-toed Treecreeper. So I can keep the record as long as I change it to that, says the eBird fellow. So, I lifer, I guess? Hong Kong is fast becoming one of my favourite cities to bird in. There is so much to see, in such a wide range of habitats, and generally so easily. It’s also a fun city to visit anyway. An on a trip to the amazing Mai Po I managed to see 70 bird species in a single day in a single location, which for a birder as hopeless as me is nothing short of astonishing. So I was particularly pleased when one of the last birds I saw was a Spot-billed Duck, a local bird and lifer. A new duck! How awesome. The issue arose when I went to log the species in eBird (increasingly the birding bane of my life). See, according to eBird, that isn’t a species. There’s an Indian Spot-billed Duck. And an Eastern Spot-billed Duck. And both occur at Mai Po. And it had never occured to me to check which subspecies (or species) I had seen. So…. I guessed. I’m sorry. So sorry that… I’ll do it again if I have to. Which I guess means I’m not that sorry. So… on reflection I guess my birding resolution should be to be a better birder? Can’t imagine I’ll stick to it any more than I’ll cut down on the wine though. Regarding the Spot-bill: Indian Spoonbill should be extralimital in Mai Po, and in China in general. The bird that you saw was most likely Eastern Spot-billed, and there are some key distinguishing traits you probably saw..if there wasn’t a notable red spot on the bill, just a yellow spot near the tip, it should’ve been Eastern. What a great round-up! I love how much you focus on urban birding, as that is what I am likely to experience in the near future myself (no epic birding trips planned for me at the moment). I am heartened to see from your account just how bird life is hanging on (and thriving?) in some cities like Hong Kong and Singapore. The whole treecreeper thing is a scam! There’s only one species! Stop falling for it! Also, I like that you don’t know what the owl is. All in all, this is an awesome round up.